I have undertaken the preparation of this little handbook for two reasons primarily—first, to introduce to hobbyists and students a new material which in my humble opinion offers greater rewards in beauty and usefulness for the time and money spent on it than any other crafts material, and second, to eliminate a great deal of the mystery surrounding the methods of working this material by reducing to a school and home workshop basis the actual professional processes and methods used by the big manufacturers. Once these mysteries are removed, and the craftsman or teacher learns how to plan his projects so that the material can be economically used, working in cast phenolic resin plastics will, I firmly believe, become a standard part of all manual training shop programs, and the home craftsman will be as familiar with this material as he is with any other on his workbench. PLATE A. 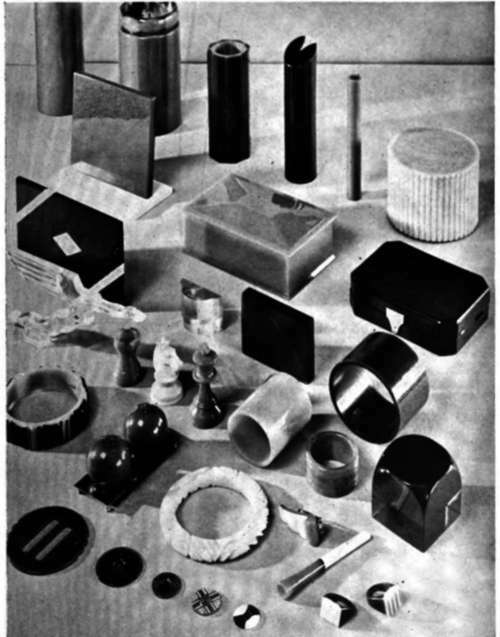 A group of objects made from cast resin plastics, and in the back ground, a few of the rough shapes from which they were made.